“FACE THE NATION» as broadcast over the CBS Television Network and the Sunday,CBS Radio Network December 13, 1964 – – 12:30 – 1:00 PM EST. MR. NlVEN: Major Guevara, we have more questions about Cuba’s relations with this country and with the Communist countries, and about your own internal situation. MAJOR GUEVARA: Not as an economist, because I have never considered myself an economist, but only an official of the Cuban Government, as another Cuban — I think harmonious relations with the U.S. would be very good for us from the economical point of view, more than in any other field, because all our industry has been established by the U.S. and primary products and repair parts that we have to make with much difficulty or to bring from other areas could come directly. And besides, sugar, which traditionally we had the American market is also near. MR. SZULC: If my recollection is right, in 1960 you made several speeches, particularly one in 1960, saying that for Cuba to go on selling sugar to the United States was a form of colonialism to which you were subjected. Have you changed your mind about this? MAJOR GUEVARA: In absolute, no. What we consider is that the Venezuelan government is not a leftist government, has nothing of a leftist government. It is an oppressor, an oppressive government, it is a murderer — he murders them – the peasant fights in the region of Falcon, for example, where there are military advisors of the U.S. There is in Venezuela today, in spite of the American press does not reveal it — the Venezuelan government is not a leftist government. MR. NlVEN: Is there any gove:rnment in this hemisphere which Cuba considers to be progressive? MAJOR GUEVARA: The word «progressive” is an ambiguous word. There is one government with which we keep diplomatic relations, the government of Mexico, with which we have good relations. Our systems are different. We respect their system. We are in a complete harmony up to date, and I have the hope that it will continue like that. But if you ask me the image of Latin America, there are sorne countries which oppress their peoples much more, and among the less — least oppresive, among those with which we could have perfectly normal relations without any difficulties— we could have Uruguay, Chile, maybe Costa Rica. But the U.S.. do not permit us. MAJOR GUEVARA: You can have the impression that our attitude is not clear. But we have the contrary impression. Our attitude is very clear. In effect there is the conflict, ideological conflict which we all know. We have stated our position in the sense of unity among socialist states — unity as a first measure. And always we argue that unity is necessity because disunity goes in favor of the U.S. , which are our enemy, and everything that goes in favor of the enemy must be eliminated. That is why we are in favor of unity. We feel that there is a necessity to strengthen this unity and that it will be strengthened and the bloc, the monolithic bloc of socialist countries will be formed again. MAJOR GUEVARA: Well, there are three or four questions rnerged in one, which I will turn to one by one. In the first place, there is a statement I would like to deny or maybe the translation was inaccurate. I heard you said I am the representative of guerrilla in this hemisphere. I am not the representative of guerrilla in this hemisphere. I would say that the representative would be Fidel Castro which was the leader of our revolution and who had the most outstanding role in the direction of the revolutionary struggle and directs the strategy of the Cuban government. As regards the two other specific questions, we do not have to participate in the controversy because they are very specific problems. The problem of peaceful transition to socialism, we do not discuss it as a theoretical question. But in America it is very difficult, and it is nearly impossible. That is why specifically in America we say that the road to the liberation of peoples, which will be the road of socialism will go through bullets in almost all countries. And I can make a prophesy with tranquillity that you will see it. With regards to the problem of the signing of the new test ban treaty, we welcomed that step as a measure which tended to prevent the a aggravation of tensions. But pointed out very clearly that us, with a military American base in our territory, where there could be any sort of weapons, where we have to endure every kind of provocations, we have to support and endure the flights over our territory. We cannot sign that treaty, because it would be a treason to our people. That is independently to the fact that we welcome the treaty in its world-wide terms as beneficial to the world. But only as that. We cannot remain here. We must continue forward if we want to prevent a world war. MAJOR GUEVARA: It is a very difficult question to answer it in a very short moment. I am being bombed by questions of all kinds. I will try to be very concise and try to explain to the American people. We had a great number of mistakes in the economic fleld, naturally. I am not the critic. It is Fidel Castro, the one who has criticized repeatedly the mistakes we have made, and he explained why we have made them. We did not have a previous preparation. We made mistakes in agriculture. We made mistakes in industry. All these mistakes are being settled now. In industry, we are now concentrating our best effort in trying to make plants work at a maximum capacity, trying to replace the equipment which is in bad conditions due to lack of spare parts from the U.S.., that we cannot get from the U.S.; to extend our industry later on the basis of our primary resources. And to lessen our dependence on external markets and dedicate our efforts in 1965 to the aspect of security and hygiene of work, to make our plants better for the worker: that the worker may feel really a man there. We have taken plants from the capitalist system where the most important thing was to produce, especially in Cuba. I do not imply that in the U.S plants, industrial plants, are now places of exploitation where man is oppressed. 1 know that there are a great number of advantages here for too American worker. But those advantages in Cuba had not reached, and conditions are very bad, very unhealthy. We have to dedicate our efforts to better the life, the time passed by the worker in the industrial plant. That will be one of our main efforts during the next year. MR. SZULC: Major Guevara, could we turn very briefly now to sorne of the internal political problems in Cuba about which we hear in this countxy in a very indirect way and we are intrigued by them. We read recently that an outstandinq member of the former Communist Paxty of Cuba, the former Senator Ordoqui, havinq been placed undex arrest. We have hear a great deal about the tensions between the so-called old line Communist party and the 26th of July movement type of group. We learned on Tuesday that Major Martinez Sanchez, who was a close friend and companion of you and Dr. Castro, triad to cornmit suicide. What is happeninq internally in Cuba? MAJOR GUEVARA: There is nothing happening which we cannot say publicly. The fact of the attempted suicide by Augusto Martinez was explained in a concise and exact form by our governmenmt in a communique. There is absolutely notthing else to add. I understand that the American people has a riqht and especially the press, which is not very friendly to us, to make all suppositions and ideas about this fact – this disgraced fact. There is always the possibility of all sorts of speculations on this. But the fact is as we expxessed it. Augusto Martinez Sanchez was separated due to administrative problems and his reaction was to attempt suicide. We regret it because of him and we regret it because of the revolution, because it has given foot to these speculations. With regards to the arrest of Mr. Ordoqui, we also stated publicly what we were able to say at that moment, and we have expressed that in the proper opportunity everything will be explained or Mr. Ordoqui will have a public satisfaction. All our public documents reflect our absolute truth. MR. NIVEN: We ha ve ten seconds. Δημοσιεύθηκε την Ιουλίου 15, 2016 Ιουλίου 15, 2016 από GuevaristasPosted in Ernesto Che Guevara,Ερνέστο Τσε ΓκεβάραΜε ετικέτα CBS,Entrevista,Ernesto Che Guevara,Interview. 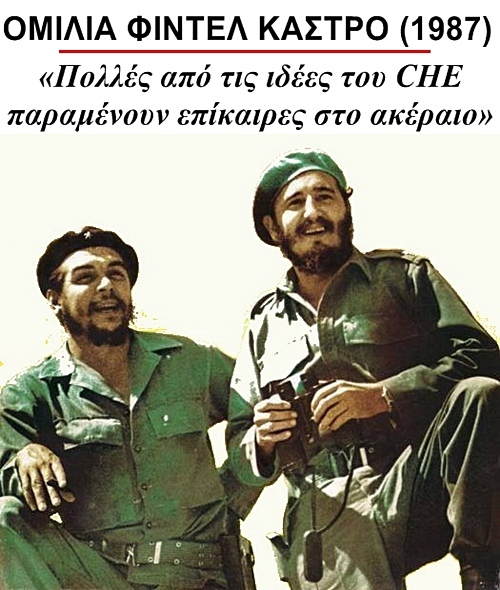 Επόμενη Next post: Ευχαριστούμε, Κομαντάντε Φιντέλ!